We opened our business in 1980 at the corner of Third and Carleton Ave. 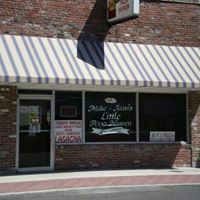 In 1985 Little Pizza Heaven moved to our present location at 505 Ward Ave. in Caruthersville Mo. We are five blocks from the , Lady Luck Casino, The Casino Inn, and two blocks from Grizzly Jig Company fishing outfitters. FYI! Our dining room seats fifty people and we also have carry out and delivery service. Here at Mike and Jean’s, we make our sauce and dough fresh every day. We use only the finest, freshest ingredients and toppings for our pizza. We also serve a large selection of deli sandwiches and appetizers, as well as Jean’s famous homemade Spaghetti.